This year at Baselworld 2016, Omega announced the new Speedmaster Grey Side of the Moon “Meteorite” (ref. 311.63.44.51.99.001). As the official chronograph for astronauts on the Apollo 11 mission, the Omega Speedmaster is the only watch qualified by NASA for use outside of a spacecraft and beyond Earth’s Atmosphere. On July 21st, 1969, Buzz Aldrin actually wore an Omega Speedmaster while traversing the lunar surface. First introduced in 1957, and nicknamed the “Moonwatch”, the Speedmaster line has always celebrated its affiliation with space travel. The Omega Speedmaster collection, Grey Side of the Moon “Meteorite”, takes the space theme one step further, using pieces of an actual meteorite as the dial of the watch. For this limited edition piece, Omega has sourced slices of the prehistoric Gibeon meteorite that landed in Nambia many millennia ago. The ribbon-like, Widmanstätten pattern of the sliced meteorite is absolutely stunning, and because it naturally occurred in outer space, each dial will have a unique pattern, and no two watches will be exactly the same. Very similar to Rolex’s Cellini released at Baselworld 2017. Keeping with the space-age theme of the dial, the 44.25mm case of the Omega Speedmaster “Meteorite” is made from grey ceramic, while the bezel has been crafted out of Omega’s Ceragold – a process in which 18-karat gold is fused to ceramic to make a single, seamless piece. 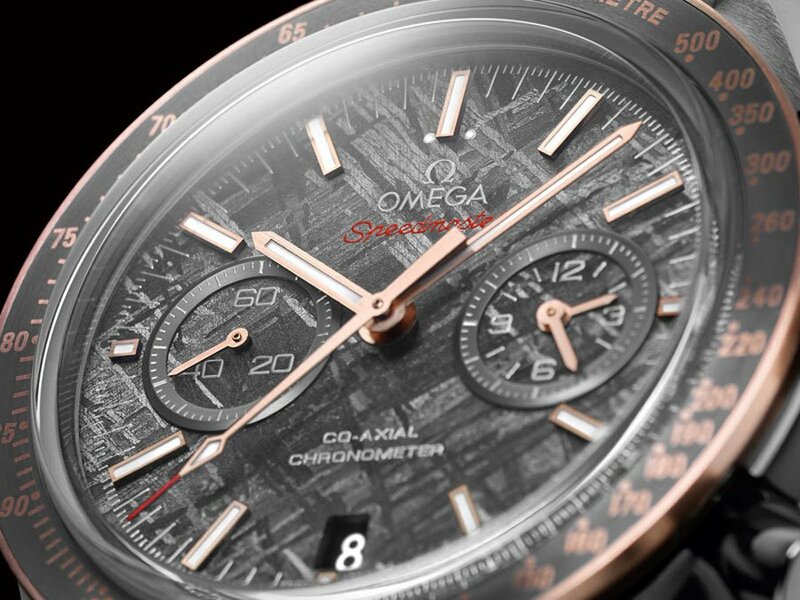 The particular blend of Ceragold on the Speedmaster “Meteorite”, known as Sedna, is Omega’s proprietary blend of rose gold, that combines gold, copper, and palladium to create a unique, yet highly durable reddish gold alloy. Powering the Grey Side of the Moon “Meteorite” is Omega’s Co-Axial caliber 9300 movement – a co-axial escapement chronograph, with a Si14 Silicium balance spring and a vertical clutch. This rock-solid movement is the same one found in other contemporary Speedmasters, and its inner workings can be observed through the Speedmaster’s sapphire, exhibition caseback. Throughout the years, Omega has released other limited editions of the Speedmaster that have alluded to its lunar heritage. There has been the “Dark Side of the Moon”, the “White Side of the Moon”, and even another “Grey Side of the Moon”. 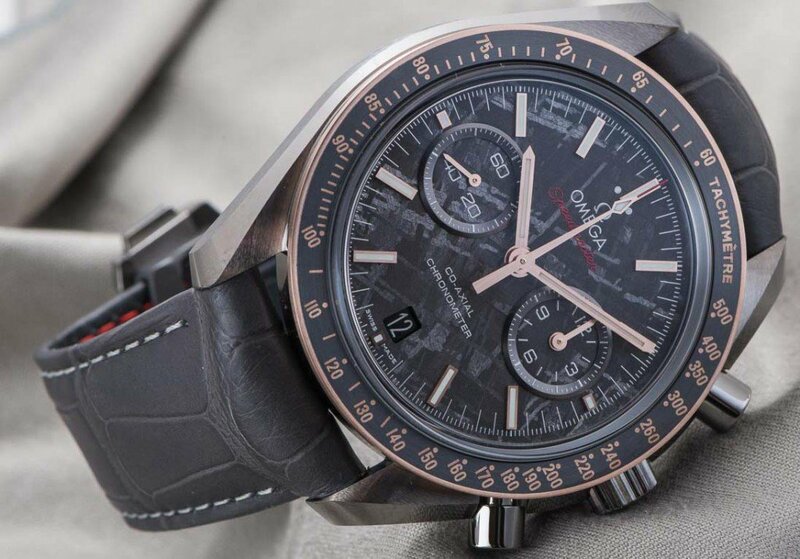 This is not even the first Speedmaster to feature a dial made from a meteorite. The Apollo-Soyuz Speedmaster, released at Baselworld 2010 also had a dial made from sliced meteorite; however this particular rendition is the first time that Omega has crafted the Speedmaster’s tachymeter scale out of Ceragold. 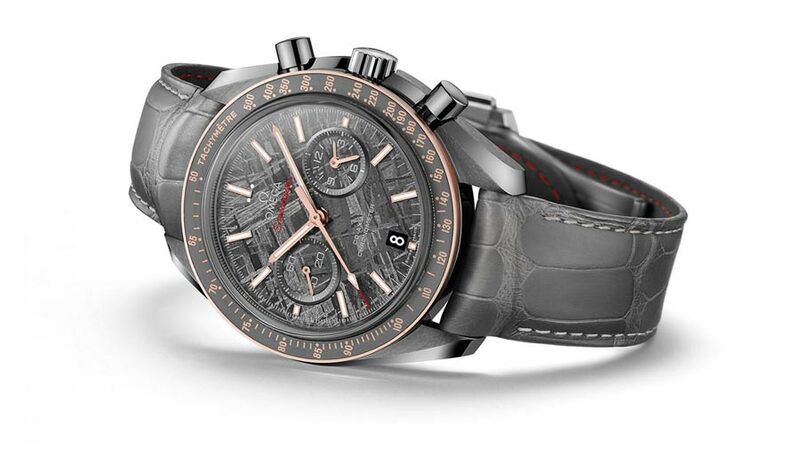 Despite not being mechanically new, or entirely original, the slices of Gibeon meteorite give the Omega Speedmaster Grey Side of the Moon “Meteorite” a unique appearance. This limited edition timepiece will be priced just north of $13,000, and will be delivered on a grey alligator-leather strap with a folding clasp made of ceramic and titanium.